This all-in-one has a removable screen that's actually an 18.4in Android tablet. ASUS has released a triple threat of a machine that should do well to confuse lots of non-technical people (and even many techies). 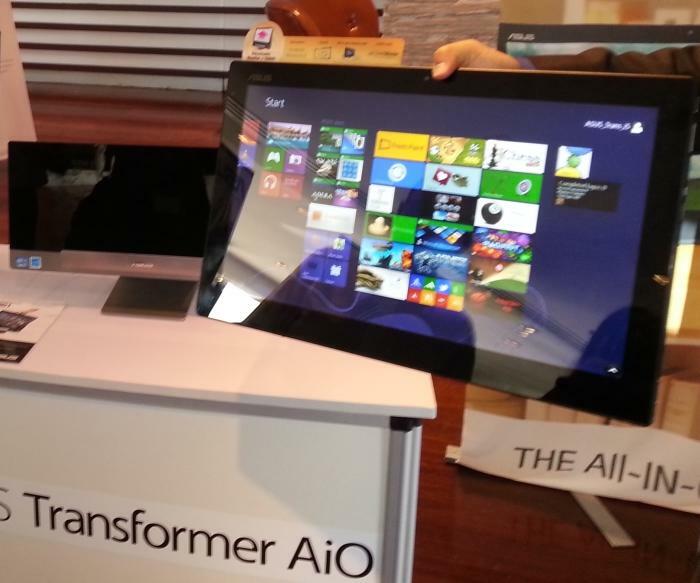 Its Transformer AiO (all-in-one) desktop product looks like a regular all-in-one PC, but there is something special about it: its 18.4in monitor is actually an 18.4in Android tablet that can be used independently of the system (and Windows 8). You can pull it out of the base and take it with you to use on the couch, at the dinner table or anywhere else around your home. But the big question is, who wants to use an 18.4in tablet? Let's explain the product a bit more: when the screen is docked to the PC on the desktop, it acts as a monitor so that you can run Windows 8 normally as you would on any other computer. As soon as you pull the screen off the dock, the screen automatically turns into a tablet that runs the Android 4.1 operating system rather than Windows 8. It's this bit that has the potential to be confusing, but what you need to know is that you are essentially getting two products in one: a desktop PC and an 18in tablet that doubles as the 18in monitor for that desktop PC (so three products if you want to count the monitor). 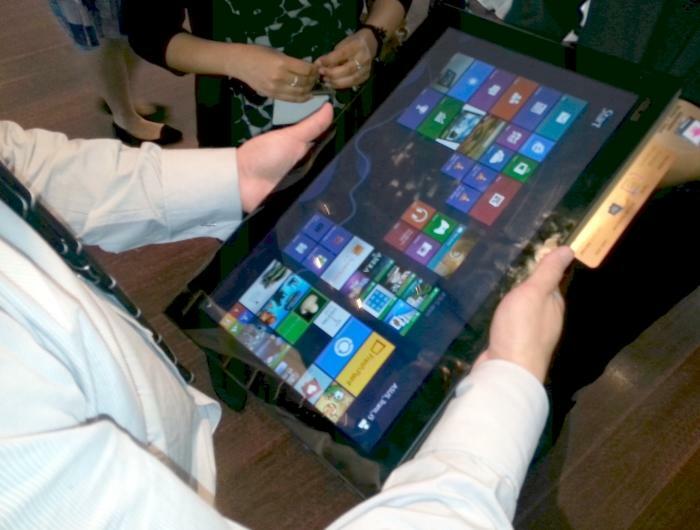 Here's the 18.4in tablet being held out of its PC base. The Transformer All-in-one has two CPUs to facilitate this design: an Intel Core i5 CPU is what runs in the desktop base (or a Core i7 depending on the model), while an NVIDIA Tegra 3 processor is what runs in the tablet itself. The reason for this double operating system solution is basically to make the tablet as portable as possible. If the tablet were to run Windows 8 natively, then all the processing power of the base would need to be in the tablet instead, and the tablet would only be docked just to access more ports, the optical drive and to charge up. By using the Tegra 3 processor to run Android 4.1 on the tablet, you get a thin, passively-cooled product that still runs a feature-rich operating system — and it won't need as much battery power to do so. (ASUS claims the battery in the tablet can last up to five hours). 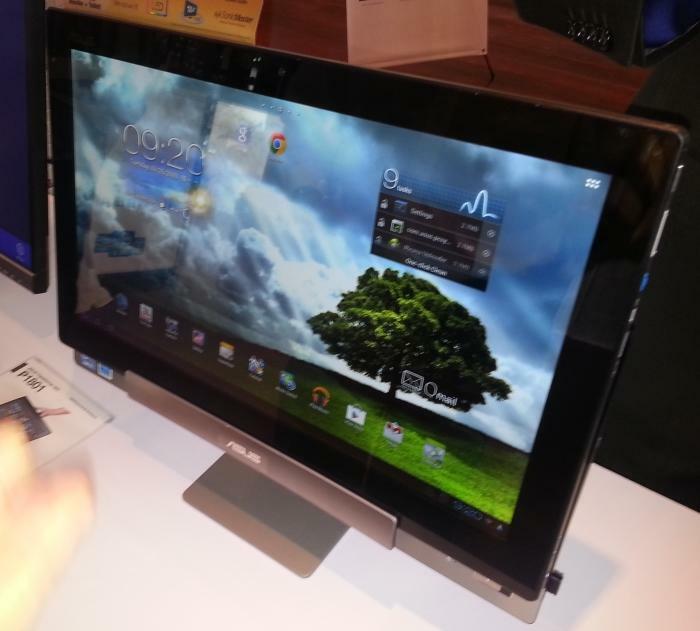 Because the tablet can't run Windows 8 natively, ASUS has installed a 'mode' app that allows you to connect to the desktop PC wirelessly so that you can control it remotely. What you'll see on the screen is a stream of your desktop and you'll be able to use Windows 8 as if it were installed on the tablet (it will be good for most things, including accessing documents and media files, or browsing the Web). Here's the 18.4in tablet in action. You can see that through the Android app, the Windows 8 desktop doesn't respond to portrait orientation. For the most part though, you can use the tablet's Android operating system for Web browsing, streaming video and anything else you might normally use Android for (as long as there is a tablet app for what you want to do). When you dock the tablet back to the desktop, there is a little blue button on the tablet that you'll need to press in order to get it back in to plain monitor mode. The hardware design seems to be good. The base with the Core i5 CPU in it sits on the table heavily and its stand allows for some tilting when the tablet is docked. The tablet screen can be easily lifted out of it with one hand (there is a flap handle on the rear) and it's just as easy to place it back into the dock once you're done. 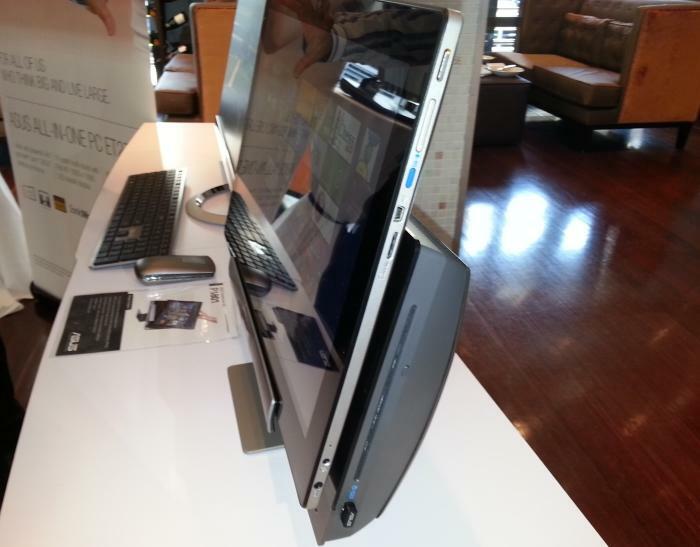 At 18-inches, the screen is large and it feels substantial to carry around or sit in your lap. Luckily, it has a stand on it similar to a photo frame, so you can just plonk it on a table in an upright position if you want to view photos or videos. It has a typical, 10-finger capacitive touch interface, so if the tablet is resting on your lap you can type easily with both hands on the touchscreen. In a nutshell, the Transformer All-in-one is an all-in-one desktop PC that uses an Android tablet as its monitor. 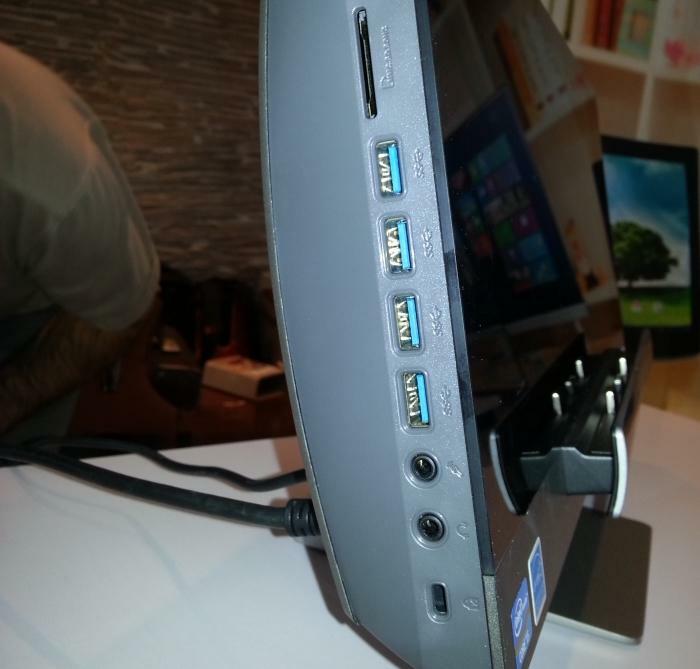 You can use it as a regular desktop computer (it has four USB ports, three of which are USB 3.0, as well as a built-in optical drive, SD card slot, audio ports and HDMI) or you can rip off its monitor and use that as a stand-alone, 18.4in tablet. The right side of the PC has an optical drive and a USB 2.0 port. The ports on the left side of the PC include USB 3.0, audio and an SD card slot. Other stuff you need to know: the screen is Full HD, the desktop has NVIDIA GeForce GT 730M graphics, there is dual-band Wi-Fi, and it will be available from Harvey Norman from a price of about $1999. We'll have more information on it once we can get our hands on it for a proper review (and better photography — sorry for the smartphone photos).